Thomas Dudek ([email protected]) is the district Extension horticulture and marketing educator for Michigan State University Extension. This week’s record-setting cold snap is a harsh reminder that extremely cold temperatures can threaten safe shipment of cuttings and plugs to greenhouse growers. Greenhouse growers need to scout for spider mites on bougainvillea and mandevilla and use appropriate treatments that minimize pesticide resistance. 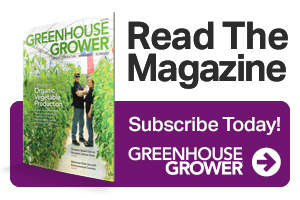 Greenhouse growers need to understand proper spray application coverage when applying pesticides and growth regulators to ensure successful treatment results.